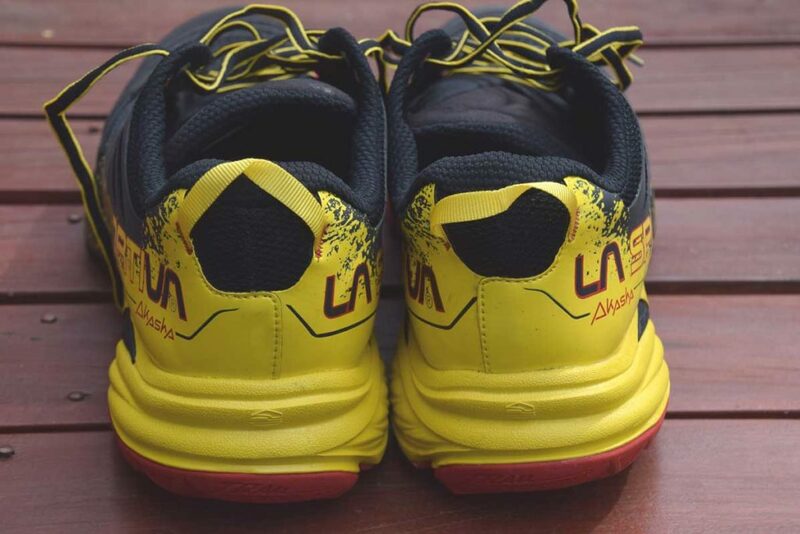 My never ending search for the ultimate hiking shoe continues and finally La Sportiva is manufacturing larger sizes in their trail running footwear that will fit me. Both my mountaineering boots and rocks climbing shoes are from LaSportiva and once I knew they had also started producing trail runners in larger sizes I scoured their website and determined that the best model for hiking was the ‘Akasha’ and luckily enough I managed to track down a pair. One thing that was obvious straight up was that the sizing is different to other manufacturers. I tried on the size 14US and they were way to small so I ended up getting the size 15US. My left foot is a full size larger than my right and this has been an issue with shoe purchases all my life. I’m still in two minds on the sizing as to whether they are good fit or not and while I’ve been wearing these for just over two weeks and have walked over 150km in them, including a 42m walk on bitumen and concrete, I’m still deciding. My right foot is very happy but the left foot is borderline. I’ll put this down to wearing a narrower, more pointed toe box than I’m used to. They are wider than the Hoka Tors that I recently reviewed but the jury is still out as to whether the Akasha will suit me in the long run. For me this is the only potential issue that these shoes have otherwise I love them. The only way you can describe these trail runners is as ‘brutish’. While I’ve worn heavier shoes the Akashas just feel robust and super protective. 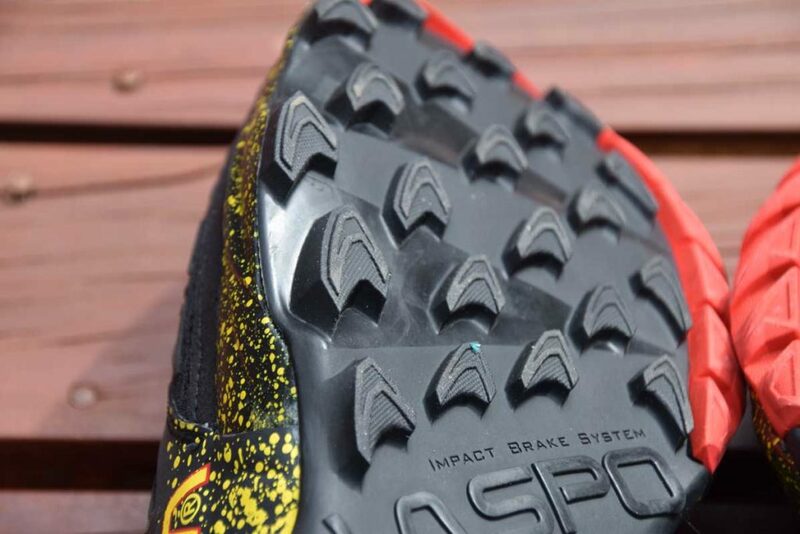 In fact I’ll go as far as saying that they feel more protective than any other shoe that I have tried over the past couple of years, trail shoes included. They provide plenty of cushioning for the soles of your feet as well as good protection on the toes, heels and sides against rocks. They also hugged my feet really well. Even with this protection I still had a good degree of sensitivity as I walked which I wasn’t expecting. One other thing that you will notice straight up is the colours on these shoes. 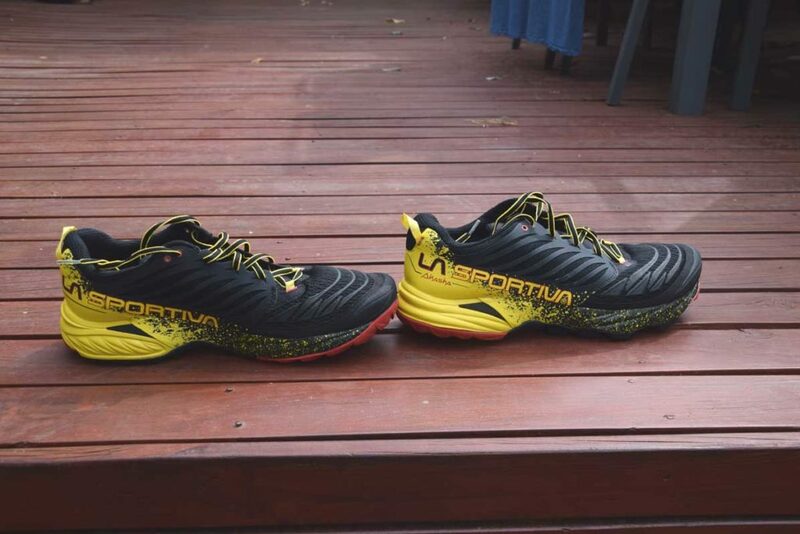 La Sportiva produce three colour choices and even the black is reasonably bright. In buying my shoes I only had one colour choice but luckily I don’t mind making a statement with what I wear. Some people may not like the lairy colours but judge them on their performance rather than their appearance. The feel ultra robust and protective ignoring sharp rocks but still provide a degree of sensitive that I wouldn’t have expected. I hope these first impressions have been helpful and over the next few months I will see how they stand up to colder and wetter conditions and make a final decision on the width. 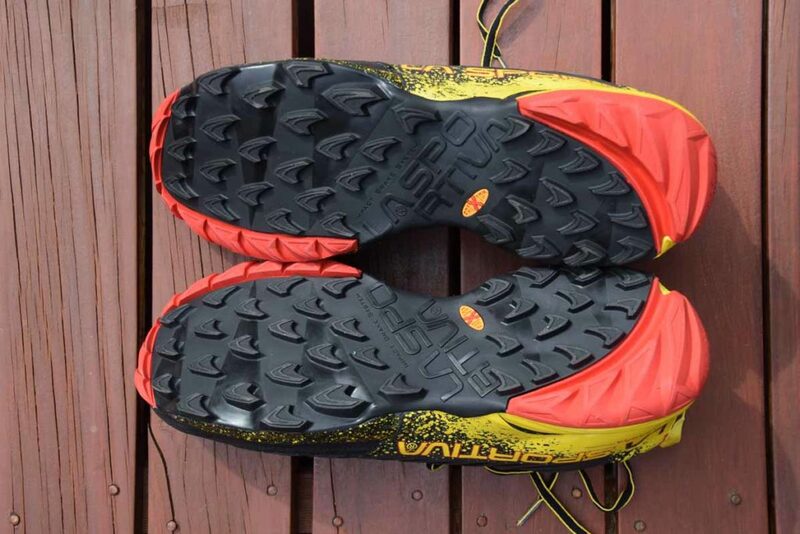 If you have a narrow-mid width fore foot then I think that the La Sportiva Akashas are well worth looking at. It’s now been seven weeks since I published my first impressions of these shoes and I have worn them intermittently for over 300km in various terrain. So how did they perform? My final impressions for this shoe didn’t really vary to much from my first impressions. 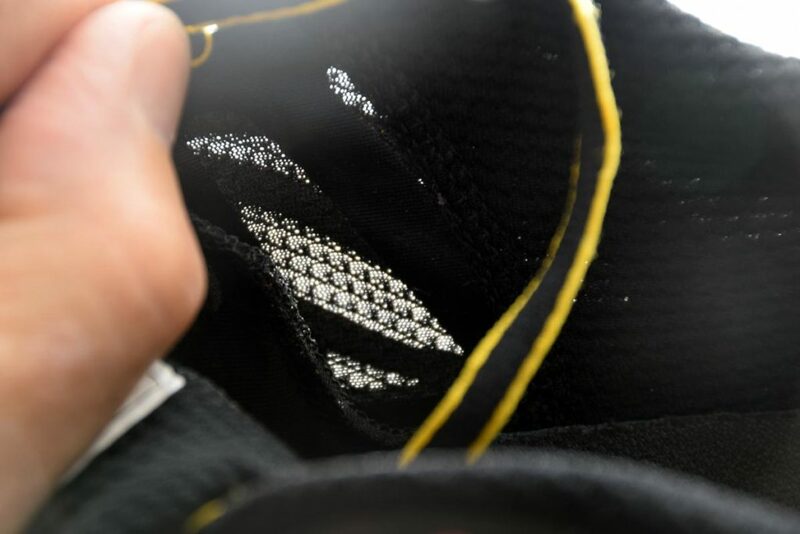 I found them to be an extremely supportive, durable shoe that can take pretty much anything that was thrown at them and they come back for more. I found them to be extremely comfortable underfoot, and they grip just about any surface without loosing traction. I also love the lairy colours and I dont mind making a statement on the trail. I just love this shoe! In addition to my positives the potential issues that I identified in my first impressions review of this shoe did pan out. The only shoe that I currently own in a size 49 are my La Sportiva Mountaineering boots and they fit me very comfortably. 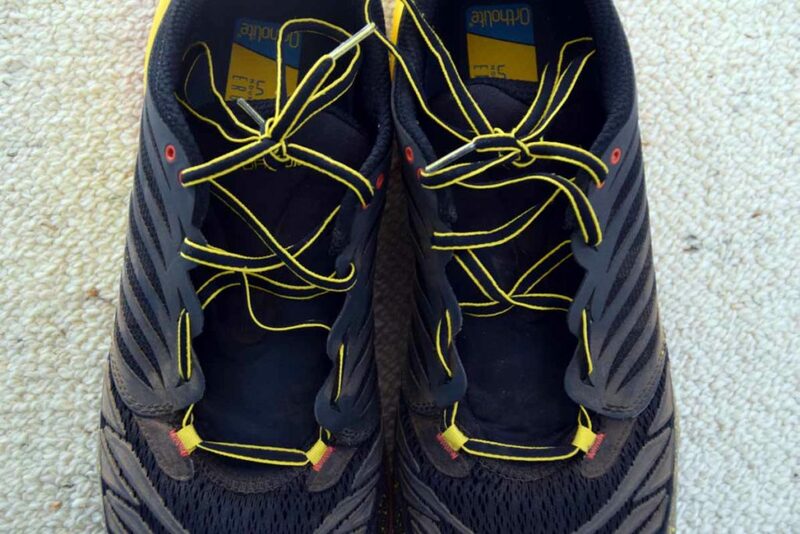 However the La Sportiva Akasha Men’s shoe have a narrower toe box and while I managed to deal with part of this issue but altering the lacing system I just found that due to my very broad toe region that even the size 49 shoes were to small. La Sportiva do make these shoes in a size 49.5 but given my sizing issue I would need a size 50 to work for me which they don’t currently make. Now I know that shoes are a very personal thing and everyone has different preferences but even though I can’t get these in my size I would be very happy to recommend them. If you can get a pair to fit you then this brute of a shoe will serve you well in just about any hiking conditions where you don’t need high ankle support. If you have the opportunity to try a pair of these on then give them a go. The Akasha Shoes are also available in a womens version. 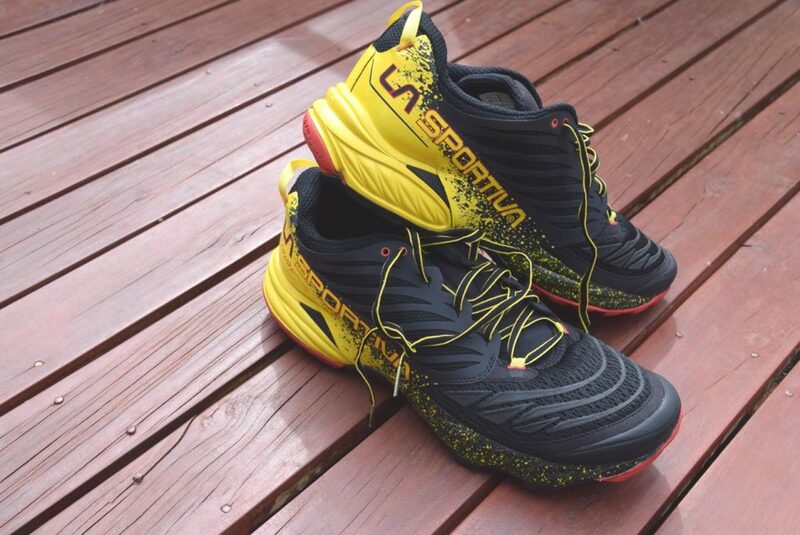 One shoe that would also be worth looking at is the La Sportiva Spire which comes in a boot or shoe version. 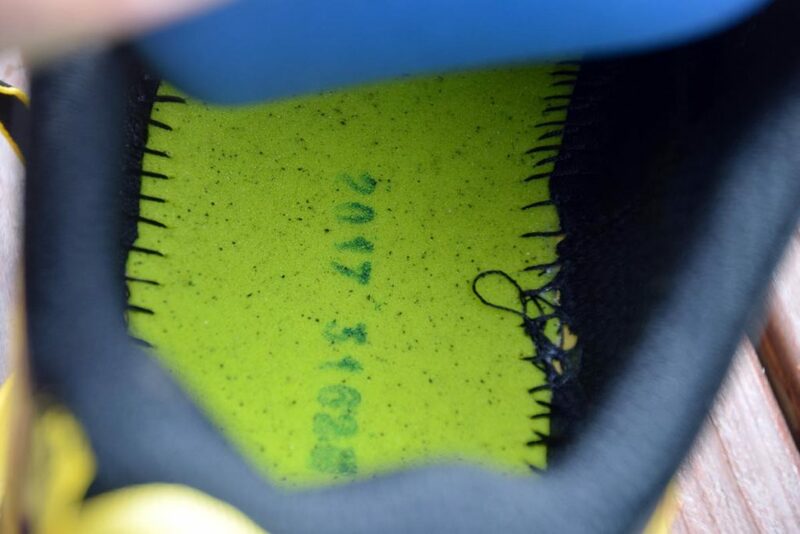 This shoe does have a wider toe box but doesn’t go as large in the sizing as the La Sportiva Akasha. I may have gotten away with a size 48-49 with the Spires due to the wider toe box.